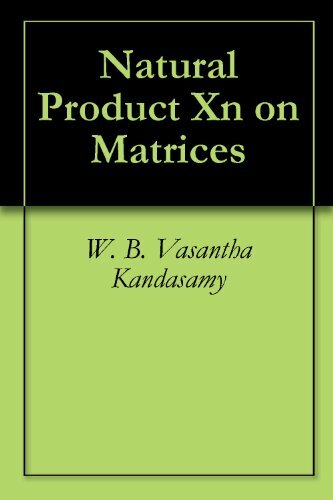 In this book the authors introduce a new type of product on matrices called the natural product Xn. This is an extension of product carried out in the case or row matrices of the same order. Further, when two column matrices of same order can be added, nothing prevents one from multiplying them. This sort of multiplication which is natural is defined as natural product Xn on matrices. Random matrix theory is at the intersection of linear algebra, probability theory and integrable systems, and has a wide range of applications. The book contains articles on random matrix theory such as integrability and free probability theory. This book is written primarily for students who are at freshman level or do not take a full course in Linear/Matrix Algebra, or wanting a contemporary and applied approach to Matrix Algebra. Eight chapters of the book are available for free. An introduction to matrix analysis, and to the basic algorithms of numerical linear algebra. Contents: Vector and Matrix Analysis; Matrix Factorisations; Stability and Conditioning; Complexity of Algorithms; Systems of Linear Equations; etc. From the table of contents: Domains, Modules and Matrices; Canonical Forms for Similarity; Functions of Matrices and Analytic Similarity; Inner product spaces; Elements of Multilinear Algebra; Nonnegative matrices; Convexity.